A spinal cord stimulator is a specialized device that stimulates the spinal cord and spinal nerves by tiny electrical impulses via a small electrical wire placed behind and just outside the spinal cord in the epidural space. The electrical wire or lead contains a series of four to eight evenly spaced electrodes that can be programmed to generate an electrical field. Spinal cord stimulators are most often used for patients with chronic and severe neuropathic pain, who have not responded to other more conservative treatments. Neuropathic pain is pain due to damaged nerve tissue. Common examples include patients with post-laminectomy nerve damage, radiculopathy, diabetic neuropathy and reflex sympathetic dystrophy. What is the purpose of a spinal cord stimulator? A spinal cord stimulator generates a low level electric field to interrupt nerve conduction of pain signals to the brain. What is the difference between a spinal cord stimulator trial and a spinal cord stimulator permanent implantation? Typically, after patients have failed more conservative treatment options, consideration is given to a trial of spinal cord stimulation. Rather than put an expensive device permanently into a patient, a temporary spinal cord stimulator wire is placed in a patient for several days to a week. This temporary wire gives the patient an opportunity to experience spinal cord stimulation without having to undergo a full implantation. If this trial is successful in relieving pain, a permanent device can be placed under the skin at another date. What determines if a spinal cord stimulator trial is successful? Usually the patient who has had a trial has a very good sense of success. Most patients who are not sure that the spinal cord stimulator trial helped will not get a permanent spinal cord stimulator. Typically, the physician is looking for a significant increase in activity tolerance or a significant decrease in the need for pain medication or some combination of both. How long does a spinal cord stimulator trial placement take? Placement of a trial stimulator wire or lead takes from thirty minutes to an hour. 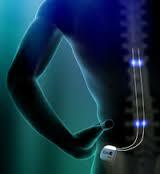 How long does a spinal cord stimulator permanent implantation take? Placement of a permanent spinal cord stimulator wire and a subcutaneous pulse generator or battery takes from one to two hours. How is it a spinal cord stimulator trial lead placement actually performed? The procedure is performed under sterile conditions. In a spinal cord stimulator trial, temporary electrodes are placed and then the patient uses an external device to generate electrical current. The electrodes are placed under x-ray guidance with the patient lying on his belly. A local anesthetic is used to numb the skin and deeper tissues. An introducer needle is passed into the epidural space. The electrodes are inserted through the introducer needle. The position of the spinal cord stimulator electrodes is adjusted until stimulation covers as much of the painful area as possible. When this is accomplished, the introducer needle is removed and the temporary wire is secured to the skin with a small stitch and a large sticky bandage. Will the spinal cord stimulator placement hurt? The procedure involves inserting an introducer needle through skin and deeper tissues. There is some pain involved. Most patients also receive intravenous sedation that makes the procedure easier to tolerate. Will I be "put out" for a spinal cord stimulator? The placement of the trial electrodes is done under local anesthesia with patients mildly sedated. This is necessary to ensure proper placement of the wires. The amount of sedation given generally depends upon the patient tolerance. The patient is conscious although some will have enough amnesia that they may not remember parts of the procedure. In a permanent placement, once the wires or electrodes are in good position, the patient is often sedated more heavily to place the pulse generator or battery. Where are the electrodes inserted? Where is the generator placed? For the pain involving lower back and legs, the electrodes are inserted in the midline of the lower back, usually above any previous surgery. For a permanent stimulator, the generator is then placed on the side of the lower abdomen or above the buttock. For the pain involving the arms, the electrodes are inserted in the midline at the upper back. The generator is then placed on the side of the chest. What should I expect after a spinal cord stimulator? If the procedure is successful, the patient's pain may be gone or quite less. The patient will usually feel a constant sensation of stimulation, often described as warm or tingly. The patient may have soreness due to the needle placement for a day or two. Most patients with successful stimulation take less, not more, medication after the placement. This procedure is an outpatient procedure. The patient will need a ride home. The patient should plan to take it easy for a day or so after the procedure. The patient can do most activities but is generally advised to avoid a lot of bending or twisting of the spine. The generator may last several years depending on the intensity and duration of stimulation required. The batteries cannot be replaced or recharged; they must be replaced surgically..
Can a spinal cord stimulator be removed? Yes. Even though we often consider the placement permanent, the spinal cord stimulator wire or lead can usually be removed with relative ease. Can I have an MRI if I have a spinal cord stimulator? No. Typically, patient with a spinal cord stimulator in place should not have MRIs. They also should not have any deep electrical or deep heating physical therapy treatments, often called diathermy. There is a risk that an MRI or diathermy may raise the temperature of the electrical wire or electrodes and potentially harm the spinal cord or spinal nerves. Can I pass through airport security with a spinal cord stimulator? Maybe. Depending on the sensitivity of the specific screening device, many patients can pass through with ease, just like some patients with pacemakers. If not, all patients are provided with identification indicating a medical device has been implanted. Will the spinal cord stimulator help? It is sometimes difficult to predict if the procedure will actually help the patient or not. For that reason, temporary electrodes are placed as a trial to determine if a permanent device will be effective to relieve pain. Typically, with successful trial stimulation, patients will have a 50 to 70% reduction in their pain. What are the risks and side effects of spinal cord stimulation? Generally speaking, this procedure is safe. However, with any procedure there are risks, side effects and possibility of complications. Common side effects are bruising and soreness. Less common risks are short-term weakness or numbness, headache, bleeding or infection. Who should not have a spinal cord stimulator? Patients on a blood thinning medication, patients with an active infection going on, and patients with poorly controlled diabetes or heart disease should not have the procedure or at least consider postponing it if postponing would improve the overall medical condition.